At 11:30 a.m. on a recent Tuesday, Colleen Duffy, a staff psychologist with Emory's Counseling and Psychological Services (CAPS), walks out of her office on Clifton Road. Accompanying her is a big dog, Beowulf. But it's not a special case of Duffy being allowed to bring her dog to work. Rather, Beowulf is the newest employee of CAPS — since Sept. 7, a contract clinician. A Native American Indian dog, she's nine months old and still a puppy despite her size. Beowulf and Duffy are taking their standard mid-day walk, heading up to the main area of campus, which they alternate with going to Lullwater Preserve. "She likes the lake there," Duffy says. As they make their way over the bridge and down past the School of Medicine, Beowulf draws the attention of students walking past. She's wearing her vest that says she's a therapy-dog-in-training and her Emory ID. Just around the corner from the Harland Cinema, a young child in a stroller stares delightedly at Beowulf, who seems to respond in kind. Duffy takes Beowulf into the Dobbs University Center, where they begin by sitting on the steps inside. As students and staff members pass by and look at Beowulf, they are encouraged to pet her. Soon groups of up to five surround her, coming and going after petting her, shaking her paw, scratching her belly and getting some licks. After a half-hour or so, Beowulf and Duffy move on, continuing their walk, then head back to the CAPS office to work. Beowulf's working day "depends on what my client load looks like," says Duffy. "She may greet the clients, sit in her place next to my chair, sit at their feet, or they may pet her. "Dogs can bridge that therapeutic relationship, and also many students on campus miss their dogs," Duffy adds. "That is something that can be incredibly comforting." Like many Emory employees, Beowulf attends meetings. On Tuesdays, she has two scheduled. "She has a place in the conference room," Duffy says. Beowulf and Duffy also attend many events on campus. "We've been to multiple events, at night, during the day, with hundreds of people. And she's calm. She can move through a crowd. And when people come to her, she'll have a big group of people petting her," says Duffy. The pair attended the recent candlelight vigil in response to terrorist attacks around the globe. "Someone there had just suffered a loss (not related to the attacks) and she went straight to that person, so she was very attuned," Duffy notes. The two have been to International Coffee Hour, Wonderful Wednesday, Take Back the Night, Gratitude for the athletics department and a number of other campus happenings. "She even went out to dinner with a candidate we were interviewing," Duffy says. Beowulf, who lives with Duffy, is still undergoing training as a therapy dog. Trainer Kimberly Brenowitz says she, Beowulf and Duffy work on techniques like pressure points. "If the dog places her head on a client's leg, the weight of the head and the warmth of her body reacts with the client's body," she explains. "If she stays there for 15 minutes, it creates a relaxation response." Beowulf is hypo-allergenic, her trainer adds, so she won't trigger allergies from her clients. "That's hair, not fur," says Brenowitz, pointing to her coat of black with an underlay of gold, and accents of brown and white. Duffy saw having a therapy dog as a "novel, innovative way to be creative outside of talk therapy and as an adjunct to that." "Beowulf helps people say things and be helped in so many different ways," she explains. "They open that other doorway." Wanda Collins, assistant vice president and director of CAPS, describes what might be dubbed "the Beowulf effect": "Anything that humanizes our office and makes it feel like an accessible, caring group of people —which now ironically happens through a dog — makes it easier for students to come in." "There are only a handful of university counseling centers that have therapy dogs," Collins notes. "I think it's more common now at universities to bring in therapy dogs during finals week, but to have a dog full time on staff is exceptional." 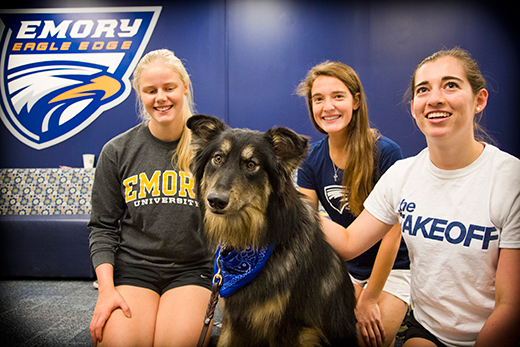 Emory Law began hosting therapy dogs during exams in 2011, and Woodruff Library joined in a year later. At Emory's Oxford College, a petting zoo has been brought to campus during finals since 2012; it returns on Dec. 9 from 2-4 p.m. on the Oxford quad. This year, Beowulf will join the other dogs at the Pet Therapy Study Break on Dec. 14 in the Jones Room of Woodruff Library. "Around exam time, you get stressed and cranky, and that's the time these dogs really come into play. They'll help you unwind and get mellow," Brenowitz says. Duffy and Beowulf will also be at the Cox Hall Computing Center on Thursday, Dec. 10, at 2 p.m.; Friday, Dec. 11, at noon; Tuesday, Dec. 15, at 2 p.m.; and Wednesday, Dec. 16, at noon. Meanwhile, Beowulf is becoming a campus celebrity. "Every day we walk around campus," Duffy says. "The other day, we stepped outside the door and a crowd of students asked if she could sit with them — three steps outside the door and she's down with 10 people." And if you see Beowulf as she works, you shouldn't be shy about approaching her. "She loves to say hello and it's OK to pet her," Duffy emphasizes. "She looks forward to meeting and working with Emory students!" At present, she will remain the only canine on the job, as there are no current plans to bring in more therapy dogs. "I think one is pretty darn fabulous," Duffy says.